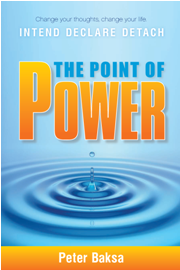 "Peter Baksa's The Point of Power must surely be one of the most common sense book to be writtten on the subject of personal empowerment through the act of intention. The author's own life proves thart he has walked every word of his book." The Law of Attraction states that whatever you focus on and intend in your life, shall be delivered to you. I propose to set forth and illustrate the three principles - intend, declare, and detach - that together explain how to operate the law. How it works is explained by reviewing the insights of Quantum Mechanics. 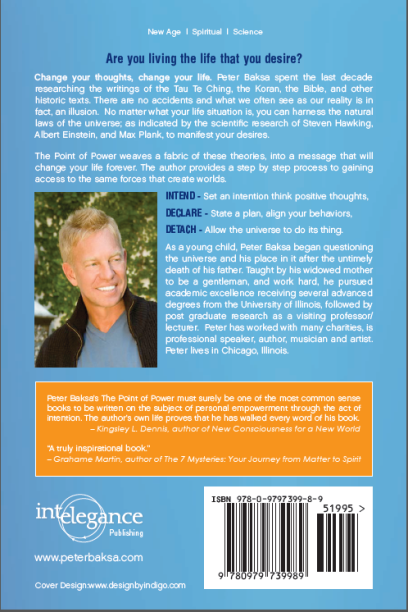 Examples, including some from the author’s life, help illustrate the steps. Trouble-shooting chapters show the reasons that the New Age; Mind, Body, Spirit; and science spirituality movements have mostly missed their goals. 2. What is the book’s thesis or argument, and what’s new about it? Every day, many people wish for their lives to be different. They can picture a new life, yet their ego really focuses on what they do not have or cannot get. This sets up resistance to the new life they seek. Discerning the lack (that is the basis of resistance) as the contrast to what one seeks can lead to desire, which then can become an intention and attention to the beliefs and emotions of already having it (detachment). The laws of physics, and not chaotic confusion, drive our Universe, including we humans. Like a frequency modulator (FM) that can only send and receive a range of signals, humans are antennas that can transmit and receive within that range depending on the level of their consciousness, with negative thinking yielding low vibrations and positive thinking yielding high vibrations. Similar vibrations attract one another. This pattern exists throughout nature. We have discussed the concept that negative thinkers (people whose brain waves have low vibrational frequencies) attract negative situations and people. Quantum Mechanics marks the borderline between science and philosophy, hard reality and fantasizing. Electrical impulses in the brain form thought, an overlay of a multitude of electromagnetic wave patterns. The equations that describe the electromagnetic spectrum, light, particles, and all that, do not care what the source of such is. Be it the light coming from a star, the electricity coursing through the power lines leading into your house, or the electromagnetic field created by your own thoughts. It all still holds. Quanta: Energy is not continuous, but comes in small, discrete units (quanta). Particle-Wave Duality: The elementary particles behave both like particles and like waves. The Wave Function: The movement of these particles is inherently random. Uncertainty principle: It is physically impossible to know both the position and the momentum of a particle at the same time. The more precisely one is known, the less precisely the measure of the other is known.